Today’s task for the 30 Day Challenge was to take a picture of something you ate. I kept forgetting all day, even though I had planned to take a picture of the delicious salad I had for lunch. Thus all you are getting today is a picture of what I didn’t eat. 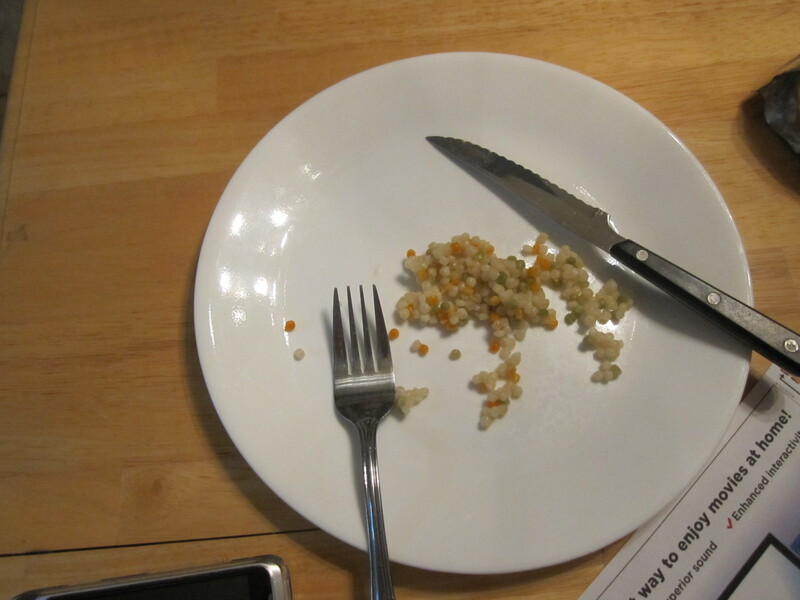 Here is what was left on my plate from dinner…a little bit of Israeli couscous. It was a tasty accompaniment to turkey breast and green beans. It was a healthy tasty meal and even my picky eaters ate without complaint. Nathaniel cleaned his plate and Allen came pretty close. The protein servings he has to eat for his exercise program/diet are a bit overwhelming. Both Allen and I are trying to get into shape and lose weight this year. He started the P90x program and got about a month into in October of last year. Then baby, birthdays and the holidays hit and all hope of keeping up with a fitness plan went out the window. Allen is now back on the program and is following the high protein/low carb phase of the diet. In the hopes of keeping things simple around the house, I am doing the same thing and we are following the servings method of the diet. I also picked up the Firm Express videos and started the first cycle this week. It is 20 minutes three times per week and there are four cycles which I am assuming get more challenging as you go. Since I am not the most coordinated person and it takes me a couple times through a exercise video to get cardio patterns down, I think I am going to do cycle one for a few weeks instead of rotating through the cycles each week. I am also adding 30 minutes on the treadmill on alternate days. I have exercised every day this week which is huge! Here’s to keeping the momentum going. Good job Leslie! Gary and I have set goals too. It is much easier to do as a team rather than by yourself. You both are setting good examples for your children as well. Exercise is my biggest hurdle! I enjoy walking but anything else is like a “job”. I will read your blog as a source of inspiration for us!